Sky Player on Xbox launches today, with a bundle that includes a media remote, a month of Sky Sports and a three-month Gold membership subscription available for £29.99. Sky Player has been a firm fixture in Microsoft news in the past week, with the Windows 7 launch also bringing the news that the streaming service would be available in Windows Media Centre. The Xbox Sky Player is less of a closely guarded secret, however, with the service first announced back in May. "Today our customers enjoy film, music, videos and games on Xbox 360 and TV is another significant step forward in our entertainment vision, said Xbox UK's Neil Thompson. "And now Xbox owners will have the variety and volume of entertainment along with unique services such as the avatar community which allow you to share, celebrate and chat – it is clear that Xbox 360 is taking entertainment beyond the living room with unique social interactive entertainment experiences." So what exactly can Xbox owners expect? Well Sky subscribers will be able to use the VOD service to watch the programmes that they currently get in their package – be it movies, sport, entertainment or all three. If you have multiroom or the top end Sky Broadband package you will also be able to stream 24 live channels (not simultaneously, obviously), or you can add this service for £5 a month. For non-satellite subscribers, packages are available from £15 (for the basic package). Perhaps most intriguing is the addition of social television features – which allow you to watch live channels at the same time as your friends and interact with them in an virtual living room populated by your avatars. When in the room you can flick in and out of full screen, chat with text or through a headset and even use emoticons to taunt your friends when your team takes the lead in controversial fashion. It's a nice touch, and one which Sky's Director of On Demand Griff Parry told TechRadar that he had become a firm fan of, after initial misgivings. "I admit I was initially sceptical, but now I've been completely sold," said Parry. "The way it was explained to me was that this is established behaviour in the Xbox community. "Things like this bring it back together again." 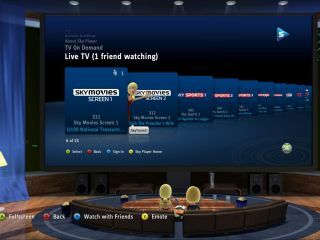 Parry believes that moving the Sky Player onto Xbox is a big step for BSkyB – adding: "Today's launch marks the first time premium live television is available through a broadband-connected games console, helping transform the way entertainment fans watch TV. "At Sky, we believe in innovating for customers so they can enjoy the content they love how they want. "Whether that's through their Sky set-top box, computer screen, Xbox 360 or mobile phone, customers have never enjoyed more choice, control and flexibility." The offer of a bundle that includes a media remote, a month of Sky Sports and a three-month Gold membership of Xbox live is likely to prove a popular Christmas present. "From a component level that is less that half the price of what you would hope to get," added Thompson. "It will give people a compelling way of experiencing this service and getting onto it really quickly."